Here is one of the first areas to catch my eye. It has long been common practice to allow players to rearrange numbers by lowering one stat to raise another, typically on a 2-to-1 ratio. Now, I’m not saying this is any different. All I am saying is that it is open to another interpretation. The compelling statement in this case is this “Clerics can use strength on a 3 for 1 basis in their prime requisite area (wisdom), for purposes of gaining experience only. (Men & Magic, pg 10-11)” I believe this can mean that the stats don’t actually change. The “secondary” ones listed merely act to supplement the Prime Requisite. That does make sense, when you consider the advancement paradigm as a whole. There is a relative dearth of direct mechanical bonuses of the sort found in later additions. In the LBBs ability was measured more importantly by level. Rising through the levels could be aided by greater natural ability, but it was only in the attainment of levels that “bottom line” ability was measured. In other words, the character’s ability to influence events in-game was almost solely dependent on level. Thus, any bonus that resulted in a character rising through the levels more rapidly could be construed as the realization of a natural aptitude or innate talent. Within that paradigm, bonuses to earned experience are very important. Far broader in application, if taking longer to realize, they actually help shape the character, moreso than simple bonuses. Of course, bonuses to-hit and damage make a Fighter better able to survive to higher levels. Yet, a bonus to XP will get the Fighter to the higher levels more quickly, which improves his chances to hit, while also speeding access to more hit points. In later editions power creep came in with the granting of stat bonuses, in addition to XP bonuses. This was always something of a sore spot for me. In the latter editions, experience did not mean as much as raw ability. A 1st level Fighter with a very high STR in AD&D could have the same chance to hit as a 3rd level Fighter of average STR, and would do significantly more damage. D&D combat has always been about modelling the result of the combat, not the blow-for-blow of it, and over the course of a fight, experience should win out. But, I digress. I think it is also compelling that only the non-primes get a direct mechanical bonus, and very small ones, at that. On the whole, I like the idea of interpreting this as the secondary stats listed serve to “buff” the Prime Requisites, but otherwise remain unchanged. I’ve included the full passage of relevant text below, I hope I’m not crossing any copyright lines by doing so. Strength is the prime requisite for fighters. Clerics can use strength on a 3 for 1 basis in their prime requisite area (wisdom), for purposes of gaining experience only. Strength will also aid in opening traps and so on. Intelligence is the prime requisite for magical types. Both fighters and Clerics can use it in their prime requisite areas (strength and wisdom respectively) on a 2 for 1 basis. Intelligence will also affect referees’ decisions as to whether or not certain action would be taken, and it allows additional languages to be spoken. Wisdom is the prime requisite for Clerics. It may be used on a 3 for 1 basis by fighters, and on a 2 for 1 basis by Magic-Users, in their respective prime requisite areas. Wisdom rating will act much as does that for intelligence. Constitution is a combination of health and endurance. It will influence such things as the number of hits which can be taken and how well the character can withstand being paralyzed, turned to stone, etc. Dexterity applies to both manual speed and conjuration. It will indicate the character’s missile ability and speed with actions such as firing first, getting off a spell, etc. In addition the charisma score is usable to decide such things as whether or not a witch capturing a player will turn him into a swine or keep him enchanted as a lover. Finally, the charisma will aid a character in attracting various monsters to his service. Note: Average scores are 9-12. Units so indicated above may be used to increase prime requisite total insofar as this does not bring that category below average, i.e. below a score of 9. A lot has been said about the Thief class. I’ve said a lot about it. I am really divided on the topic. Yet, there are times when player description just isn’t enough. Describing how to pick a lock isn’t something most of us can do with any degree of accuracy, for example. So, I do think there are instances where player skill needs to give way to character skill. Besides which, I like the idea of a skulking character of unsavory repute, but he is necessary. While I like the idea of any character doing thieving things, I also like the idea that one character may be better at it, or an aspect of it, than another character. I’ve given some thought to various methods of making this happen. I could just allow the Thief from Greyhawk to the available classes. If I did, though, it would give one class a monopoly on thiefly activities. I could make available a “graft” of the thief skills, at an XP cost. This seems ok, but just doesn’t feel right. I’m not crazy about the thief skill being this homogenous blob. I prefer the idea that a guy can be a first-rate lockpick and not know a damn thing about sneaking around. lastly would be some method whereby players could select thief skills for their character, cafeteria-style, at some sort of premium, such as additional XP. The drawback to this option is that it starts straying into the murky area of a skill system, which I prefer to avoid. Here’s an idea I had. I’m just spitballin’, but here it is. 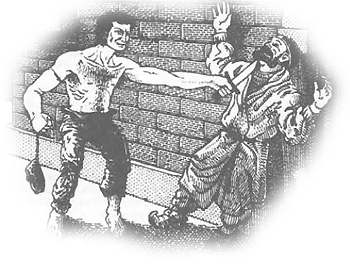 In Greyhawk, the majority of Thief skills are divided up into two broad categories: Open Locks/Remove Traps and Pick Pocket/move Silently/ Hide in Shadows. I propose that Fighters and Magic-Users (only) may opt at character creation to have certain Thief skills. 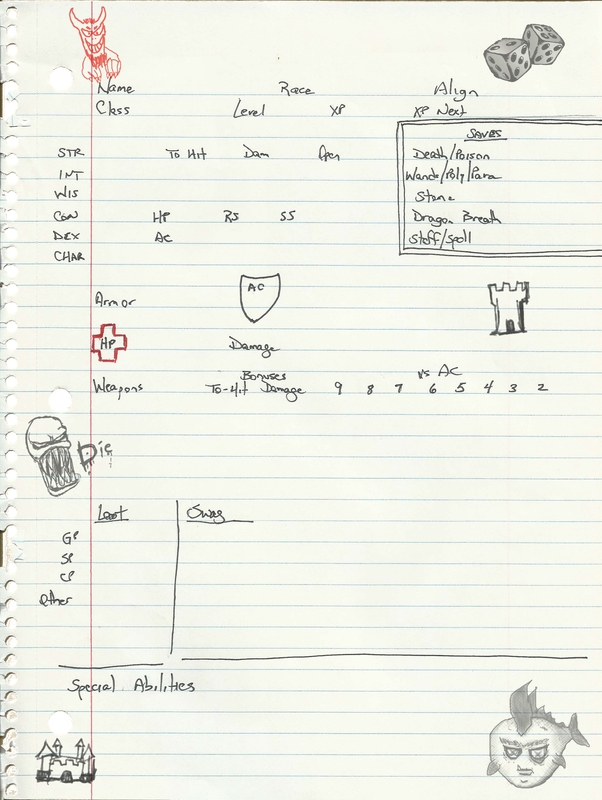 The player may choose one group for his character to have. The choice must be made during character creation, and can not be changed. The character advances in those skills per Greyhawk. In return, the character must forfeit 15% of earned experience. Up to 10% of this may be offset by high Prime Requisites. I’m not so sure I’m crazy about that either. But there it is. If anyone has an opinion on the matter, or that idea, I would love to hear it. Ok, I just had another idea. This one can apply to pretty much anything, not just thief-like activities. Very simply, when the outcome of something is too variable to allow a player to simply describe his character’s actions, roll d20 and add the most appropriate stat. The referee will do likewise, high roll is successful. This can be used for anything from picking a lock (give it a rating to be added to the d20 roll), to sneaking past a guard, climbing a wall (d20 + rating based on surface and conditions), deciphering something written in a lost language, etc, etc. I hate to sound like I’m patting myself on the back, but I really like this idea. It even takes class into account, in a way. If the referee allows players to place stats rather than rolling in order (which I do), then the best numbers will be allocated to the stats that are most relevant to the class. In other words, there’s no need to give Fighters a bonus on a physical roll because he will most likely have his best number in Strength anyway. If you want a guy that is above average in the thieving arts, just be sure and put one of your better numbers on DEX. If it means missing out on the Prime Requisite bonus, then that’s the cost of being a jack-of-all-trades. This should also play very fast at the table. All in all, I think I might be onto to something here. Ok, so, like I said, I’m back in the old school vibe. 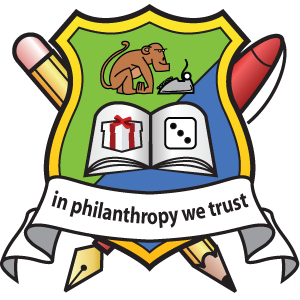 Part of that lead me back to the excellent essays at Philotomy’s OD&D Musings (http://www.philotomy.com/#overview). If you’re an old schooler who’s never read these musings, stop reading this and go there now. I’ll be here when you get back. If you have read them before, read the again, they are that good. Reading (more accurately re-reading) made me want to really dig into the LBBs. See, I started really getting into D&D with my best friend at the time. He begged and borrowed the books long enough to hand copy them (the LBBs and Greyhawk). He taught me, was always the DM, and never relinquished his hard-won copies. So, back then I never actually read the rules. Eventually I did buy a white box, but by then I thought I knew it all already, so didn’t read it. 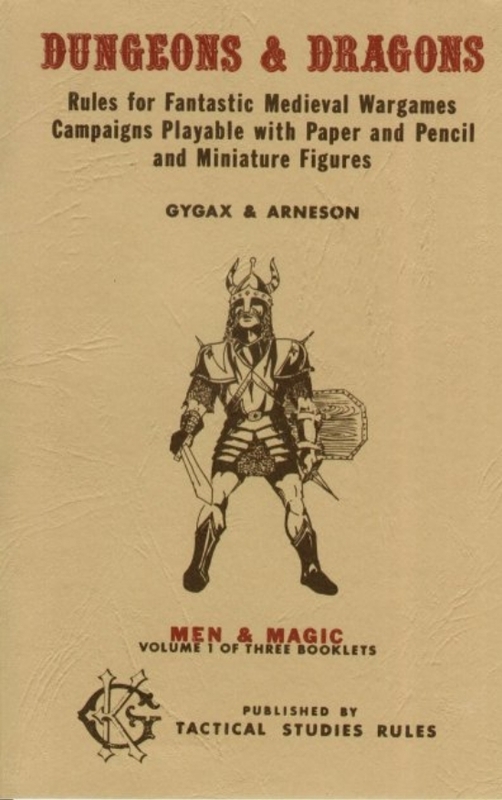 Then came AD&D. Long story short, while I’ve read bits and pieces, I’ve not read them cover to cover. When my old school urge fell on me, I immediately decided to set the Way-Back Machine for 1976 and avail myself of all the Supplements released by that time. Upon reading Philotomy’s excellent advice to read the LBBs with a fresh eye, I decided it was high time I do so. All I can say, is DAMN! Sure, there are numerous references to Chainmail. But, for a book that weighs in at a svelte 30+ pages, digest sized at that, this is a remarkably complete character book. The most remarkable thing about Men & Magic, though, is its internal consistency. Individual systems and subsystems have been picked apart and criticized piece-meal for years. They’ve been ridiculed, laughed at, and called outdated. And all that was said from the instant Runequest arrived on the scene. The thing is, the systems and subsystems don’t exist in a vacuum. They are all part of a cohesive whole, and when they are left alone to function in that environment, they function unbelievably well. This post isn’t going to be a guided tour of all the things I never realized were in there. It is an introduction to a series of posts offering guided tours of things I never realized were in D&D from the very beginning. Most of the time those earliest versions are still better than systems and methods designed with 40 years of collective design experience informing them. So far these has been a very rewarding experience, and I hope that by sharing it with you, perhaps you’ll be inspired to reacquaint yourself with the prototype from which all others sprang. Here’s a character sheet I drew up and scanned. It’s meant to be reminiscent of something that might have been at a table in ’76. The stat order, with CON before DEX, is pure LBBs, as are the Saving Throw categories. I also included spaces for stat mods from Greyhawk, as well as AC adjustments to-hit. I know it’s not the Next Big Thing, but I like it. Hopefully some of you will, too. Hello, everyone. Please accept my apologies for being so reticent of late. It’s been a combination of a general lack of focus, family obligations, and being sort of bummed that blogspot went south on me. Anyway. Those of you that suffer Gamer’s ADD know that anything can trigger a shift. I was scrounging around for fonts the other day when I found one named Quentin. Fairly unassuming, right? One problem: it’s the red-letter font proclaiming D&D on a certain white box (pictured at left). That was all it took, I tried to fight it, I really did. I was nursing a cyberpunk/Alternity mood that I was pretty happy about. The lure of my first gaming mistress was too strong, though. So, here I am, back in 1976, Or at least pretending to be, game-wise. Planning a campaign (which will likely never get played) using only what was available in December of 1976. 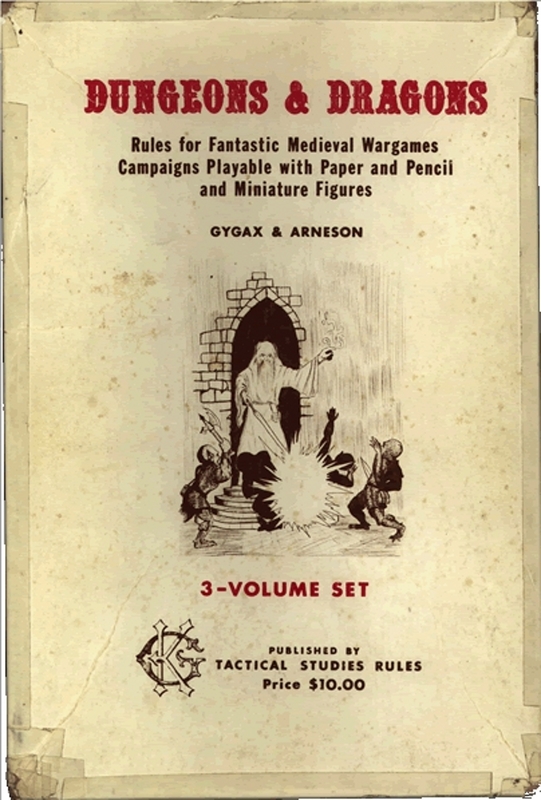 Incidentally, in case you’ve missed it in other posts, I really was playing in December of 1976, having been introduced to D&D that September (or maybe October, but I do believe it was September). All the issues of Strategic Review, and the first four of The Dragon. There really is some great stuff in those early issues of those mags. Some of it quickly became canon. There is one “modern” convenience I’m using. I am working on randomizing a wilderness map using Welsh Piper’s templates. I’ll post it when I get (at least) the Atlas map done. What gives a game legs? I’ve read a lot about how a lot of rules-lite games are good for pick-up games, but lacking for long-term play. There are some instances where that is obvious. There are some, though, that I don’t see it, so that started me to wondering: What aspects/compnents are necessary for a game to shake off the good-for-pick-up-game stigma? Honestly, once we stray beyond the obvious, and into more ill-defined territory, that definition is as elusive as the OSR itself. Obviously, chracter development is huge. However, Dungeonslayers takes characters all the way to level 20, and it is still referred to as a beer-and-pretzels game. OD&D is a character development wasteland, as far as written rules support, but to this day no one thinks of it as a one-off engine. There’s a certain line in the sand, as well. Phase-line Crunch, let’s call it. Too many character development options becomes too crunchy, too burdensome, and too inviting to munchkinism. There’s also system longevity to consider. In other words, will the actual play get stale over time? Are there enough mechanical options to keep players engaged with the system? Will combat be the same roll-to-hit, roll-to-damage at 15th level that is was at 1st level? Is spell casting going to scale with level, or will it merely be an exercise in casting more spells? I don’t have any hard/fast answers, nor do I know if we really need answers. It’s just something I was thinking about.